We've built our reputation on consistently serving you the best - in taste and quality. We believe in using only the finest and freshest quality ingredients for our recipes because we believe you deserve no less than the best! As we mark 66 years in service to Springfield and the Ozarks, we would like to express our appreciation to our many loyal friends, customers and employees. We're a family business and the most important part of this family has always been you. We dedicate this milestone to the people of the Ozarks. Thank You, we look forward to serving you for the next 66 years and beyond. All vegetables are sliced and prepared daily in our kitchen to ensure their freshness to you. Because our concern is to provide healthful, wholesome food, we use 100% vegetable oil in our food preparation. We also use only USDA inspected 100% pure beef that is boiled in water to reduce cholesterol and fat. At our factory, preparation of corn tortillas is carried out much the same way as in Mexico of old. Lava stones are used to grind the corn into "Masa" (corn dough). The masa is then rolled, cut and sent through our tortilla oven with the end product delivered to our restaurants. We also produce our famous hot, mild and sweet sauces, which can be purchased at any location or online. In 1943, our country was at war and millions of young men left home to “join up”. Garin Ferguson left Springfield, his girl-Betty Hall, and a job at Heer’s Department Store to join the Army Air Corp. First stop was Aloe Field in Victoria, Texas. Missing Betty, he sent a telegram proposing marriage. She said yes and they married on his first leave. While flying P-40’s, B-24’s and B29’s at Randolph Field in San Antonio, Garin (Hargrave to many of you) fell in love again...with Tex-Mex food. This passion for Mexican food would follow him home to the Ozarks. After the war, the Fergusons returned to Springfield. Garin started Ferguson Crop Dusting Service, dusting and seeding from here to Tunica, Mississippi. His career would span 17 years, 11 pilots, 9 Stearman biplanes and one run-in with power lines. Garin and Betty bought the Pig-N-Bun in 1951, a longtime barbecue restaurant at National & Bennett. There, Garin gave Springfield its first taste of Mexican food! Working from Texas memories and with the help of Mike (yes, the legendary Mike), the same recipes you enjoy to this day, made their debut. In the late 50’s, the Fergusons moved to Glenstone (across from the Cat & Fiddle) to open “Old Mexico”, the city’s first carry-out restaurant. They leased the Pig-N-Bun to Tommy Lafino for his Italian Villa. Betty worked in the restaurant while Garin cropdusted. He would “buzz” the restaurant on his way to the Division Street airport, so she would know to go pick him up. When Tommy Lafino retired, the Fergusons came back to National, replaced Italian with Mexican on the neon sign—Mexican Villa was born. The El Taco on Kearney opened in the early 60’s followed by the Villa East, Comida, Villa West, Villa South and El Taco in Ozark. Mexican Villa is proud to grow with the Ozarks—sharing your special moments, watching your families grow. Many of you stopped in to work and some of you stayed. We could not have done it without all of you. 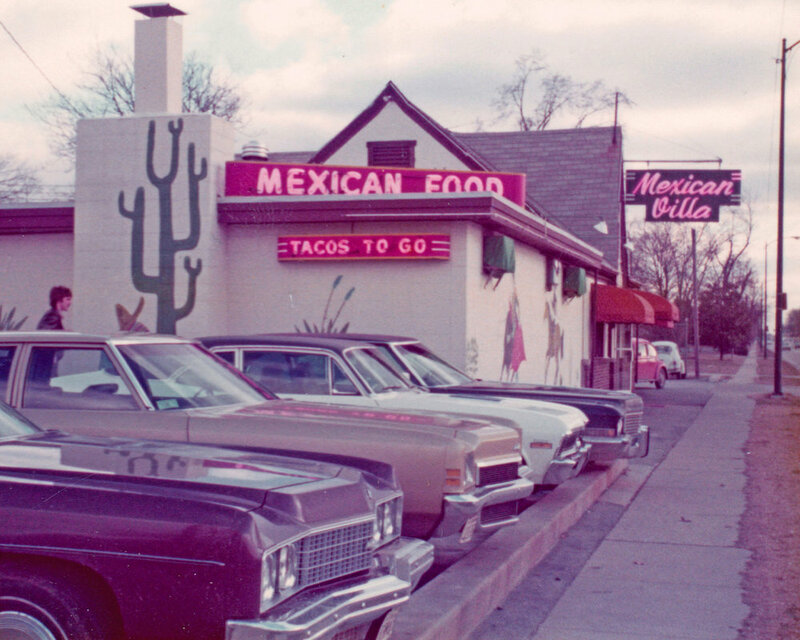 As our story goes on, (three generations now),we look forward to serving you the Mexican food you grew up with.